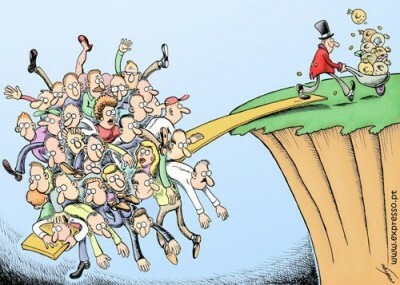 The UK has become the most unequal country in Europe in terms of wages and income distribution, according to a newly-published report by the Dublin-based Foundation for the Improvement of Living and Working Conditions (Eurofound). Eurofound was established in 1975 to contribute to the planning and design of better living and working conditions. It carries out its role in partnership with governments, employers, trade unions and the European Union institutions. The growing inequality in the UK is the main driver of inequality within the whole of the EU, according to Eurofound. “…the level of wage inequality in the EU as a whole is below that of the US. However, wage inequality in the UK, the EU’s most unequal country, is now above that of the US average. The UK, Latvia and Portugal are the three most unequal countries in Europe. “The Great Recession changed the trend of overall EU wage inequality. Between 2004 and 2008, EU wage inequality decreased; after 2008, it increased. “The decrease before the crisis was entirely due to a significant reduction in between-country wage differentials (in other words, a process of convergence in pay levels), which came to a halt in 2008 and even started to reverse at the end of the period of this analysis (2011). “The main driver behind the increase in wage inequality after 2008, nevertheless, was within-country inequality, which until that point had remained more or less stable. In addition, the UK now has the worst Gini coefficient in the EU. Gini is the most widely accepted measure of how fairly income is distributed amongst a nation’s residents and is the standard measure of inequality. With a Tory government committed to punishing the poorest through further austerity measures, and a leaderless Labour Party looking to lurch to the right, it appears that the UK will face growing inequality for at least the next decade.